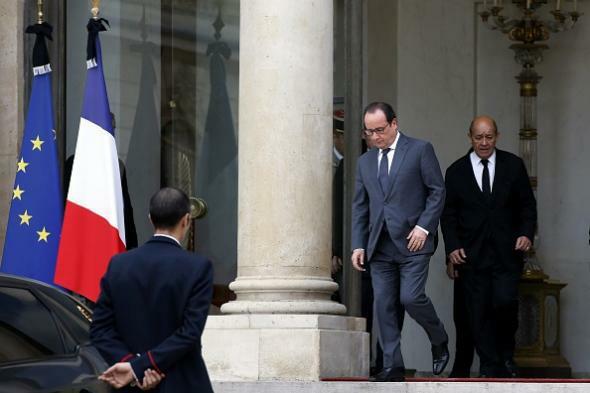 Hollande: France will honor commitment to take in 30,000 refugees. French President François Hollande leaving the Élysée Palace in Paris on Nov. 18, 2015. President Obama has said the U.S. will take in 10,000 displaced Syrians, a plan that many Republican governors (and one Democratic governor) are now protesting because of the purported danger that ISIS operatives will infiltrate refugee groups. State governors do not appear to have any statutory authority to reject refugees, while the process of being approved for entry takes 18–24 months and includes multiple security measures. Obama has criticized Republicans for suggesting the U.S. renege on its commitment. The perpetrators of Friday’s Paris attacks who have thus far been identified were French citizens. A passport found near one of the Friday suicide bombers identifying him as a Syrian refugee is believed to be a faked document, though fingerprint evidence appears to show that, whatever the man’s real name and origin, he did pass through Greece earlier this year in the guise of a refugee.